Don't Miss Out On What This Home Has To Offer!! Breathtaking mountain views, privacy, and room to spread out! We offer old-world charm with a large 2-story country home. A rustic gas fireplace invites you into the large living room. 4 bedrooms upstairs (sleeps 7-8, 2 queen beds 1 full, and 1 twin, with a futon in the pool room for extra sleeping) 2 full baths both with a tub and shower. Large kitchen with all the amenities, full sized refrigerator and cook stove, microwave, coffee pot and dishwasher. We also have another full sized refrigerator in the attached garage for your use. We have a laundry room with full sized washer and dryer. For entertainment we have a pool table, games, cards, Dish TV and stereo/radio, and large green lawns for outdoor activities. We also have an outdoor fire pit for your enjoyment. Three large decks and a small balcony. The lower deck has a gas BBQ grill and table and chairs to enjoy your meals or just sit back and relax. Enjoy your morning coffee on the back deck off of the kitchen nook, breathe the fresh air and take in the majestic view of the Elkhorn Mountains! The upper deck has the most fantastic views of both the Elkhorn and Eagle Cap Mountains. Enjoy the various wildlife that frequent the area.. deer, elk, maybe even a fox, just to name a few! Included is a one bay attached garage for your car, snowmobile, sleds, ski's, motorcycles or anything you want to keep out of the weather. There is also boat/RV parking available. We are close to skiing, snowmobiling, hiking, fishing. There is a 2 night minimum. This is a working farm and there is a chance during summer months that we will be haying during your stay. Be assured there is plenty of space and you probably won't notice someone driving through the barnyard. You may enjoy kicking back on the deck and watching them cut/bale hay! Only minutes away from beautiful, historic downtown. Baker City offers unique shops, wine tasting, great food and several events such as 1st Friday (art displays), 3rd Thursday (wine walk), Miners Jubilee just to name a few. This property is located in a farming community. It is very quiet and peaceful. A great place to relax and enjoy the fresh air. We offer 2 full bathrooms with modern features. One bathroom is upstairs and the other on the main floor. Country farm setting close to historic downtown Baker City. Coffee, tea, hot chocolate, pepper & salt. Toilet paper, paper towels, laundry detergent also available. Dining area in the kitchen and additional breakfast nook. Please notify us if you are in need of a high chair. Small balcony off the Cowboy room. Upper and lower decks with the most FANTASTIC views of the mountains. The lower deck has a dining table and chairs for 6 and a couple of gliders. Very comfortable home, with several amenities great for my family. Close to the mountain, and I appreciated the garage. If you don't know, Baker has got it going on! Beautiful setting for this comfortable home, with multiple outdoor spaces to sit and enjoy games or meals. Very peaceful and quiet. Close to Baker City; try the Lone Pine Cafe for breakfast or lunch. Good hikes nearby, at the Oregon Trail Interpretive Center and up to Anthony Lake. Very enjoyable and relaxing stay. The property was clean and included everything you needed to call home. The rural setting made for a very relaxing stay. The weather was very hot, but the house was very comfortable. The owners were very responsive to our needs. 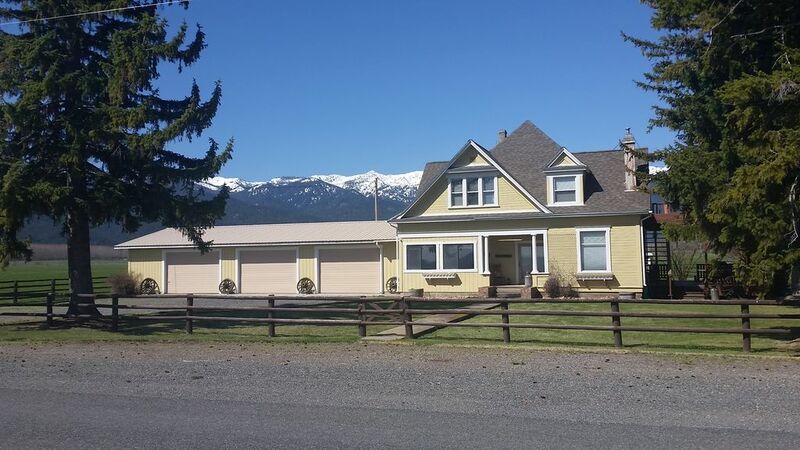 We would highly recommend this property for a great stay in Baker City. Set in the middle of cattle country this is a beautiful and quiet property. Mountain views at sunrise and sunset are wonderful. The house is a well -maintained country home with all basic needs accounted for. We really enjoyed our stay at this lovely farmhouse. My only complaint is that we didn’t get to stay longer! The views from both front and back of the house were spectacular. This is an older home, but obviously well-loved by its owners. We loved seeing pictures of how the farm has progressed over the years. It has all the amenities you would need (minus wi-fi). The window A/C units kept the bedrooms upstairs nice and cool, and the downstairs stayed cool on its own. The owners gave us helpful suggestions for places to eat and things to do. I would definitely stay here again! This was a charming place, and we loved being able to sleep without hearing each other snore. Coffee was available, the kitchen was a great place to make a celebratory meal, and the details made this place absolutely amazing. Our house offers a "home away from home" atmosphere with everything you need. We are located in a centralized quiet faming community but still within minutes of beautiful, historic downtown Baker City. Baker City offers unique shops, wine tasting, great food and several events such as 1st Friday (art displays), 3rd Thursday (wine walk), Miners Jubilee just to name a few. Renters have no access to any outbuildings, barn, etc. We will keep partial/full deposit if pets or extra guests that are not on the reservation stay without prior notice/arrangements.